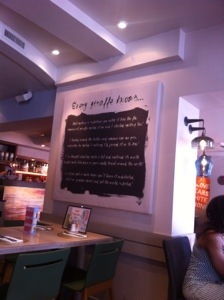 Ok, so the one note I made for the blog whilst eating breakfast in Giraffe was “pepper mill”. That’s it. It sits in black and yellow in the middle of my iPhone notepad and full of promise of significance, a knowingness that those two words would trigger my most valid observation about breakfast in Giraffe. All promise, and no delivery. Why did I write pepper mill? WHY was I so lazy as to not even to contribute a verb? Readers, please, if pepper mill for you captures the very essence of the Giraffe breakfast experience, comment or tweet ASAP. It’s keeping me awake at night. In my defence, and in Giraffe’s favour, this could be due to the deeply involving breakfast menu available. Nothing is what you see elsewhere. Well… It didn’t ought to be right? Giraffe is supposed to be quirky in a feel good sort of way. This is in sharp contrast to the rest of the day’s menu. I have never seen the point of Giraffe’s daytime menu in comparison with the selection from M&S. I have frequently ordered from it and wished I hadn’t. Are there delicious dishes on there that I am missing? Please advise. Breakfast however came down to ordering three drinks each and three breakfasts between two of us. It was brunch, so that’s how we learnt to live with ourselves. We called the third breakfast (Brioche French toast with compote and yogurt) dessert. It was delicious (it featured fried carbs and sugar- duh!) and the very kind staff let us order it even thought we were strictly beyond the breakfast cut off time by then. But even at that, it was a step below the savoury breakfasts. Mine was huevous rancheros,: chorizo, black beans, cheese, adobe sauce, avocado & tomato salsa on tortilla- spoilt only by the fact that my poached eggs were hard poached, but otherwise full of exciting flavours. It did taste similar to the breakfast burrito that seemed to be the same dish but wrapped and with the addition of chipotle (which according to the rather uninformed waitress was sausage- she is not correct.) 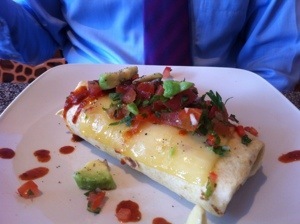 Believe me, the closed nature of the breakfast burrito lends a more closed taste. I really do mean that – closed, sort of not open like a pizza. 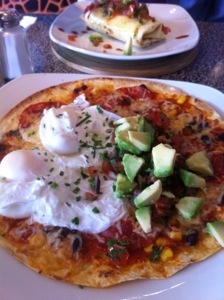 Perhaps enviously more complete, but significantly lacking poached eggs. 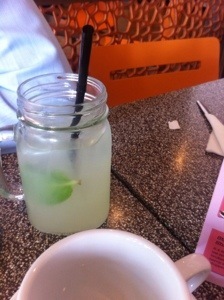 Fresh lemonade with mint was a must. Now does that handle on a jar look like a gimmick to you? It is apparently a deeply authentic style and originates from the Southern States. However hard you try it seems impossible to source one with a lid… Which surely must be the only justification for the screw top… Which leads me back to the thought that somewhere, at some point in time, this was a gimmick. Now that it has earned authenticity, it has become an authentic gimmick. Contents were fabulous however. And then there was the tea. Teapigs? Sorry guys, no. I agree that Teapigs is an expensive brand, but expensive really isn’t quality. I find myself frequently reminded of this when it comes to tea. Earl Grey is often more bitter than it ought to be, so I rushed my ordering and chose Darjeeling. Sadly on arrival I discovered it to be Darjeeling (origin of leaves) Earl Grey (flavouring). Not actively bad, but disappointing. The teapot however is excellent. 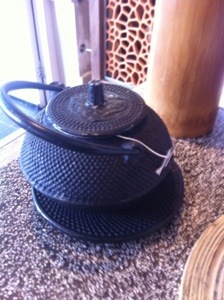 Why do cast iron teapots make one so happy? The simplicity of fresh orange juice just managed to be more exciting than the wide variety of smoothies. And the Moroccan mint tea is fabulous. It is not actually made in the Moroccan fashion (by which I mean it takes less than three quarters of an hour to prepare and you can chose to have it without sweetener) but it comes as water loaded with bunches of fresh mint. Now you may have noticed a rare number of my blogs expose seeming prejudices on the part of the staff. Chapter’s mysterious inability to ever provide us with table bread, for example. In the case of Giraffe, there was a definite balloon distribution prejudice. If you were under 3 foot you could summon a profusion of balloons, just by showing your face. My husband and I? Nada. So Giraffe are prejudiced against tall people. Seems odd given their name. This entry was posted in Blackheath, giraffe, Restaurant and tagged Blackheath, Breakfast, Brunch, cast iron tea pot, eating out, giraffe, huevous rancheros, mint tea, SE3, tea by blackheathcoffeeshops. Bookmark the permalink. Hmm, It is unfortunate that these days not many people know how to make tea, especially the more delicate teas. Though it is true that the water needs to boil for the more common black tea, fully boiling water brings out the bitterness in Earl Grey. Earl Grey tea needs oxygenating, but fully boiled water has little oxygen left. I think it’s because it’s designed for people who put milk in Earl Grey. It’s original use has changed, and so the product has changed.